The LPA set a date of March 27 for a Public Hearing to remove Historic Ordinance 151 from the town's code and place an amended version of the town's old historic codes in place. Two weeks ago, the McIntosh Town Council voted to repeal Ordinance 151 and then immediately approved a motion for the Land Planning Agency and the Historic Board to hold a meeting to hash out an improved version of ordinance. The spirit of that motion would allow those who support the ordinance and those who disagree with it a method for revising the ordinance to a law that everyone could be happy with, or at least live with. But the joint meeting, held during a noticed LPA meeting last night, was missing one vital element in the discussion: The Historic Preservation Board. No one from the Historic Preservation Board showed up to represent their concerns with the ordinance. LPA chairwoman Charlsie Stott said the town clerk sent an e-mail to the board members. After the meeting, Council President Frank Ciotti - who just stepped in as the meeting was ending - confirmed an e-mail did go out to the members. Also missing from the discussion were community members who might want to voice an opinion in how the ordinance is either reshaped or removed from the town's codes. This could be due to the nature of the public notice displayed in the shadowbox at town hall. The notice advertised the LPA would meet, but it did not specify that this meeting was a workshop or that this was to be the joint meeting between the two citizen boards. Further, no agenda was posted to let the community know that this issue would be addressed. This is the second time this year that LPA notices have not accurately informed residents about the nature of the business being discussed. Rezoning McIntosh land came before the LPA in January during a meeting that was not publicly noticed with an agenda. Last fall, Adria Harper, from Florida's First Amendment Foundation, presented a Sunshine Seminar in McIntosh and said that while a simple notice of a meeting is sufficient, it is in everyone's best interest to post an agenda so people who would be effected by a policy or law change can have input. Four of the LPA members were present at last night's meeting. Secretary John Sapp was missing. Half the board present last night were not in attendance at the last council meeting, in which the orders from the council were made in motion form on how to precede with the amending 151. The LPA members discussed some parts of the historic ordinance they did not like. However, the objections from both Councilman Lee Deaderick outlined in detail two weeks ago in the council meeting, nor objections voiced this month about the ordinance's repeal from residents who support the current historic ordinance were heard. The LPA will meet again on March 13 at 7 p.m. No agenda has been posted. 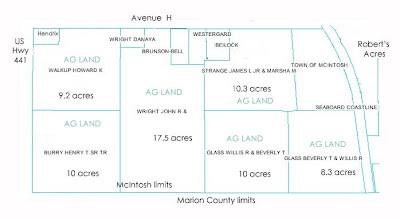 Last week, the McIntosh Town Council heard a recommendation from the LPA that they could rezone agriculture land belonging to Mayor Marsha Strange, Council Vice President Howard Walkup and Bill and June Glass to R1. Between Jan. 30 and Feb. 12, the LPA meeting, in which the citizen board voted to recommend rezoning, became an "unofficial" meeting. Before board chairwoman Charlsie Stott gave her findings to the council, she asked if she should since the LPA did not have a public hearing on the issue. However, at no time during the LPA meeting was the committee informed the subject matter they were voting on was "informal." This determination was made after the fact. While the meeting wasn't a public hearing, four of the town's five council members were present. Two council members commented during the rezoning portion of the LPA meeting. Council President Frank Ciotti's questioned the amount of development that could be potentially opened up by the rezone. Councilwoman Eva Jo Callahan asked if the land was within the city limits. The three property owners in question were present at the meeting, while other property owners were not present, nor were they included in this first "testing-the-waters" phase of the process. This point was not brought up in either February council meeting. While the matter of rezoning isn't as pressing as it seemed two weeks ago, it seems to remain a potential agenda item for McIntosh. After Stott made the LPA's recommendation on the first day of the February council meeting, Councilman Lee Deaderick tabled the issue of rezoning, saying that ultimately the subject could take up an entire workshop meeting. This tabling came after a discussion launched on who should pay the rezoning fees. If the town initiated the rezoning, then it would have to take on the burden of advertising the changes, paying a planner -- Bruce Day -- to look into the impacts of such zoning and other administrative fees that come up. If the property owner posted it, he or she would foot the bill. Initially, during the Feb. 8 meeting, council members batted around the idea of the town paying to rezone land belonging to two elected officials and one citizen board member. This drew the criticism of one town resident, Steve Race, later in the meeting. Race was meeting some resistance when asking the council for financial assistance solving a drainage problem the board had previously voted to help him with. He made note during the meeting to the council they were willing to entertain the town paying to rezone their own land, but not willing to help him with his problem. Later, during the continued meeting, the mayor asked to readdress the issue and told the council that as long as the town was having financial difficulties, she suggested any rezoning be paid for by the property owners. Looking at the question of rezoning in McIntosh requires looking back at the issue over the last two years. Just going back a month begins to tell a little more about the story. In the January 2007 town council meeting (Jan. 11, audio file 2:11:38 to 2:16:00), Walkup asked Town Clerk Debbie Miller to put agriculture rezoning on the agenda. Councilmen Ciotti and Deaderick both questioned in that meeting how that topic got on the agenda. Ciotti said, "I have no idea where that came from." "Where did that land density come from?" Deaderick said. "That came from Howard," Miller said. "A long, long time ago, we asked the LPA to consider changing the Land density from 110 to 2 in 1, then they hashed it back and forth and came back with a 1 in 1 with 150 frames, I remember all that," Walkup said. " I don't know whose court it's in now. I spoke to Scott about it the other day and he was almost of the opinion that we needed to start over. Attorney Scott Walker said he couldn't remember if it was turned over, or denied. "If it's in the council's court, maybe the council can go ahead and vote on 1 in 1 with a 150 foot frontage and that sort of thing. If that's what the council wants to do," Walkup said. "If it's in our court. I'm in favor of sending it back to the LPA and asking them to start over with it and do what they originally recommended." "Residential estate is what we called it," Ciotti said. Deaderick made a recommendation that the LPA look into rezoning and bring them any recommendations they might have. He said for them to "send us something of what they'd like to see. " A motion passed unanimously to have the LPA reconsider zoning from Agricultural to R1, with Walkup voting to have the LPA looking at rezoning his own land. In the past, when the issue of rezoning this land came up, minutes show that Attorney Scott Walker advised council members not to vote when their own land was involved. For this reason, many of the votes over the last two years show Walkup and former council member Danaya Wright abstaining from the decision-making process. Why Walkup initiated rezoning and voted to have the LPA consider what to do with his land this year is not known. What is known is a story told through the McIntosh public records. At that time, minutes show that Wright expressed concern because the rezoning was bring fast-tracked. Mintues show she said she wanted the LPA to establish the standards in the McIntosh codes for development before the land was rezoned. At the time, Day had been hired to help bring the codes up to date. Different zoning types were considered and argued back and forth including agriculture 2, residential 1 and something called residential estate. On June 21, 2005, letters were sent out to the five property owners about the AG2 rezoning. (July meeting) This set in motion another recommendation to the LPA that a new AG2 category be created. When an issue of rezoning is being considered, neighboring property owners must be notified. The issue at the time was not unlike the current struggle over the historic ordinance. Council members Wright and Strange read letters into the record from the following residents showing concern over the zoning at the August 11 meeting: (August 11) the DiMellas, the Phillips', the Westergards, the Fellmans, the Glasses, the Weitners, the Aults and Sean Dowie and Tammy Flagg. Even back then, Marsha Strange said she had no intention of developing her property. Eventually, the original intent to rezone changed from three owners seeking a zoning change together when Walkup decided to seek zoning on his own that fall. Former McIntosh Town Councilman Jim Strange has billed the town for the remainder of his legals fees from challenging a petition filed last year to recall him. Last August Strange sued Sportsman's Cove owner Casey Girardin, Marion County Supervisor of Elections and McIntosh Town Clerk Julie Musselman for their roles in circulating and certifying a recall petition against him. The ruling in his case last summer directed the petitioners to clarify their petition and recirculate it, if they wanted to continue the recall. Before Girardin could resubmit her petition, Strange resigned from his elected position. According to e-mails sent to the town's attorney, Strange filed a claim with the Florida Municipal Insurance Trust and was sent a check for $3,787.13 under the town's bond policy. Strange claims in this letter that the judge ruled in his favor and would like the town to pay him the remainder of his legal fees, $1917.99. The town already paid legal fees defending the town's clerk against Strange's lawsuit. The town's attorney, Scott Walker, will advise the council of his opinion whether or not the town should pay for Strange's legal fees. 02.14.07 -- REPORT: Repealing Historic Ordinance 151: "the nits need to be picked"
The McIntosh Town Council agreed in a four-one vote to repeal Historic Ordinance 151 Monday night in a continuation of last Thursday's February council meeting. The grappling over the ordinance began Monday night with Mayor Marsha Strange reporting that an unfounded rumor had been circulating that the town wanted to do away with the historic district altogether. She told the council she'd been contacted by Vanessa Thomas and that four McIntosh residents went to an Ocala meeting and told their historic board the town was attempting to do away with the historic district. The mayor asked the council to make this point clear. Though the mayor declined to give the names of the four residents attending the meeting but did note that they were present, Barbara Fellman said she was one of the four who attended the Ocala meeting. Council President Frank Ciotti made mention of how some people might be confused by what has been written about the historic ordinance in the McIntosh Mirror. However, the Mirror has never reported that the town is attempting to get rid of the district. No council member or committee member has said in a public meeting this is the town's intent. In all of the proceedings regarding this ordinance since Council Vice President Howard Walkup made the motion to repeal 151, the only person to suggest that McIntosh's historic district be "gotten rid of" was Bill Glass in the Jan. 30 LPA meeting, to which Charlsie Stott replied she didn't think that was what they wanted to do. Public records requests have been made for the minutes of the Ocala meeting. On the other side of the grappling fence, the LPA met in January to discuss historic ordinance 151 and voted unanimously to recommend that the council repeal the 151. At Monday night's meeting Susan Phillips protested that this issue going to the LPA to begin with. Therein fell the confusion to whether or not the council did or didn't sent the issue to the LPA. A look back at the Jan. 11 council meeting audio file, shows the council and attorney Scott Walker discussing at length around point 1:23:00 sending the historic ordinance to the LPA for revision. In the midst of the discussion, Councilman Lee Deaderick tabled in the discussion to February so he could line-by-line read the historic ordinance and gather resident opinion. It seems that the LPA jumped the gun by taking up the issue in January. During the council meeting, the language regarding the LPA decision used by Walkup was that the LPA had an "unofficial" meeting regarding the historic district. The meeting, publicly noticed, followed the Sunshine Law, as far as Florida statutes require. But an agenda wasn't posted and therefore, the issues brought up can't be considered a public hearing, which are required when an ordinance is repealed. The interim between the January meeting and the February meeting gave Deaderick a chance to do what he promised: thoroughly read Historic Ordinance 151. Deaderick provided a line-by-line series of objections Monday night to the ordinance. "I took personal offense to that the word morals ... that somehow morals are tied in with the historic houses," Deaderick said. "The other thing was the this served the spiritual needs of this community and I wasn't sure that that was an accurate portrayal." Other areas he flagged as problems dealt with landscaping clauses, paint color, ban on the parking of commercial or large vehicles in the historic district and the idea that the historic board could approve what businesses were given occupational licenses. One point he returned to again throughout his criticism was that he said he did not think that a citizen board should have the amount of power that would be granted to the historic preservation board by this ordinance. Phillips interrupted at one point to tell him that he was just nitpicking. "What you're doing is really unfair," Glass said. But the councilman defended his right to pick at the historic ordinance, as he had with previous ordinances like many revisions he's pushed for from the tree committee of the new tree ordinance. Deaderick said "I've been to a code enforcement board meeting where the nitpicking was as detailed as this, so the nits needs to be picked," he said. He said that he thought that what was important to the character of McIntosh had very little to do laws and codes but more to do with the civic organizations and people in town. Ciotti also mentioned that he did not understand the language in the ordinance pertaining to a buffer zone. Last summer, McIntosh residents voted to have a ban against expansion of the current historic district. Yet, ordinance 151's language spells out methods for including homes in the district, even against a home owner's wishes. Listen to Councilman Deaderick's objections to Historic Ordinance 151 by clicking on the black triangle. (Internet Explorer users may need to click the start arrow twice.). Ciotti was the dissenting vote in Monday's night's repeal. A surprise vote to repeal came from Councilwoman Eva Jo Callahan. Walkup and Councilwoman Eunice Smith were expected to vote for repeal and Deaderick was assumed by the community to be the "swing" vote on the issue. The council's repeal of 151 will mean that the ordinance will go under revision. Immediately after the repeal was approved, the council passed another motion by Deaderick to have the LPA and the Historic board meet and made a series of revisions based on concerns he expressed about the historic ordinance. Currently, 151 is still on the books in McIntosh, but the repeal process -- going next to the LPA -- could yield revisions enough to make 151 acceptable and not have to pass through a second repeal, which would remove it entirely from the town's codes. The process will open up the revision process to the community in the form of public hearings for the combined LPA and Historic Preservation Board members to work on council members' concerns. A full report of last night's McIntosh Town Council meeting is pending. In the meantime, the full recording of the meeting is available now. Don't want to listen to all 3 hours of discussion? Click and drag the player to the topic you want to hear. The Town Council will meet this Thursday. Thanks to Debbie for e-mailing a copy of the agenda. A) Minutes of the Town Council Meeting of January 11, 2007 and Workshop Meeting of February 3, 2007. In a recent meeting of the Land Planning Agency, board members voted to recommend the council look into rezoning land zoned for agricultural use to residential use without including neighbors or other land owners with similar parcels. While several of the land owners were present, Council Vice President Howard Walkup, Mayor Marsha Strange and Bill Glass, other property owners of agricultural land were not aware that rezoning was under consideration. Further, two of these property owners' land use was discussed in their absence. Danaya Wright, who owns property next to Walkup's, was not contacted before the LPA meeting. At the meeting Glass told others that Wright's land was in a conservation easement and therefore would keep a large amount of development in the area being considered behind Avenue H.
Wright's agricultural property is 18 acres and borders Walkup's, Glass' and Strange's. "We were not asked (the 4 of us own it together); it is not in any conservation trust though I would consider it. I would also consider developing if everyone else did. Also, I was not asked if Howard's land should be rezoned and that is absolutely required by law. All neighbors must be asked and given an opportunity to provide input." Wright is a UF Law professor and expert in property law, as well as the former town council president. In addition to Wright's land, Chris Rath's property, another large track of agricultural land in McIntosh, was discussed Tuesday night. Chairman Charlsie Stott said Rath did not want to rezone her land from agricultural use. In a phone interview today, Rath confirmed this. But she also said she was not contacted before this meeting. Glass suggested that the LPA attempt to rezone her Rath's property while the town still had some control over it. Rath said this afternoon that she wants to keep her land zoned agricultural as long as she possibly can. The LPA is an advisory board. Any final zoning decisions will be made by the council. Four town council members were present in the audience at the LPA's meeting Tuesday, Council President Frank Ciotti, Walkup, Eunice Smith, Eva Jo Callahan, as well as Mayor Marsha Strange.